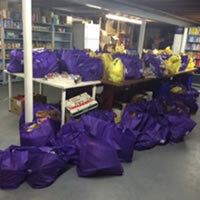 As physical director of the St. Vincent de Paul Food Pantry, I would like to express my sincere thanks to St. Magdalen’s 8th grade CCD class for their tremendous Lenten food drive. As a result of your endeavors, our pantry has never been so well-stocked with much needed products that our 84 families receive on a weekly to monthly basis. I would be remiss if I did not express my gratitude to everyone at the Office of Religious Education who worked extremely hard to bring this project to fruition: Bridget, Maggie, Jennifer, Michele, and Billy. Last but not least, my heartfelt thanks to the parents of these CCD participants who made this last year’s Lenten food drive a truly wonderful success. We often go to God in prayer, not when things are seemingly going well but when a particular trial or struggle arises. We seek clarity and peace when we are unsure of how to act or what to do in a given situation. In those moments, hearing God speak can be difficult. How can we know that God hears us and that He truly cares? Faith. When we approach Jesus in Eucharistic Adoration we do not know beyond a doubt that all of our questions will be answered or that our problems will be solved. What God does assure us of, however, is that He is with us, He hears us, and He loves us. In faith we place our needs before God, knowing that simply being in His presence will bring healing and peace. 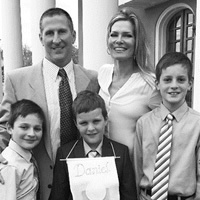 Raised in the Assemblies of God Church, my relationship with Jesus was personal and secure at a tender age. However, all things Catholic were foreign to me and sadly misunderstood. A love for the visual arts motivated me to enroll in 4 years of art school where I studied the world's great artists,and traveled abroad on several occasions. I remember a particularly powerful encounter that occurred while standing inside the Vatican, at Saint Peter’s Basilica in Rome, staring at Michelangelo’s Pietà. There was Mary, enveloped in graceful acceptance, lovingly and tenderly holding her son's limp body. I could feel the weight of our crucified Lord upon her lap. Looking back now, I see this as my first powerful introduction to our Blessed Mother. Another profound moment occurred while sitting through Mass inside Germany’s Kölner Dom (Cologne Cathedral). Amidst sacred music, billowing incense and grand stained glass windows, I felt strangely at home. Not yet Catholic, my heart was being stirred!Years later, by the Holy Spirit’s gentle prompting I enrolled in RCIA, and was welcomed into full communion with the Catholic Church in April of 2011. Prayer is conversation with God, but how can we converse with God who is pure spirit? How can we speak toGod or hear Him speaking? According to St. Ignatius of Loyola, we can know God is speaking when athought is good, it is consistent, and it brings peace. We learn to pray by learning to observe what takes placein our hearts and in our minds. God speaks to us constantly and He is always present to us. What changes isour awareness of His presence. When we come before Jesus in the Blessed Sacrament, we need not come upwith beautiful prayers to recite. To recognize that He is present before us and in our hearts is itself a prayer.The more we realize that Jesus is present, the more clearly we will hear Him speak. The Bread of Life discourse in John 6 can be disturbing to some and puzzling to others. Why does Jesus commandus to eat His flesh and drink His blood? The answer can be found at the first Mass, which took place at the LastSupper. The Jews celebrated the feast of Passover every year to commemorate the moment in history when Goddelivered them from slavery in Egypt, but ultimately from the Angel of Death. To ‘ransom’ their first-born sonsthey had to slaughter an unblemished lamb, spread its blood on the doorpost, and eat its flesh. When Jesus and Hisapostles are celebrating the Last Supper, they are actually celebrating Passover, but if you read the text carefully,the only item missing from their feast is the lamb. Jesus is the new Passover lamb—He ransoms every baptizedChristian from the Angel of Death. He offers lasting freedom and ultimately eternal life. My name is Kevin Shanoski. I am the Financial Secretary for the Knights of Columbus Jubilee Council and a 23 year parishioner of St Magdalen's. Recently, as part of our annual membership drive we hosted a Theology on Tap event at the Lone Eagle Brewery here in Flemington. 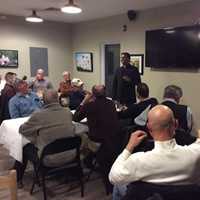 It was a very successful evening filled with laughs, comradery and insights into our lives as Catholic men and prayer offered by our brother Knight Fr. Antony. This event brought more new Knights to our council than our prior membership drives. It also brought back many Knights we have not seen for a while. Beer and theological reflection apparently go together as well as beer and pizza, which we had too. Sometimes we feel closest to Jesus when we are on the Cross. We sense, even in our suffering, that if the Lordwere not sustaining us, we could not continue forward. Jesus is close to all those who call upon Him but He isparticularly close to those who suffer, both emotionally and physically. Those who suffer can identify withJesus who Himself suffered every kind of emotional and physical distress, from rejection and persecution, tocrucifixion and death. In Eucharistic Adoration we come before a God who suffered for love of us and continually sustain us with His grace. May we come before Him to receive the graces we need to preserve incarrying our cross. May we realize that He never abandons us, but rather carries the cross beside us. Certain things naturally complement each other: peanut butter and jelly, sunshine and rain, men andwomen. This is also the case on the supernatural level. Adoration of the Blessed Sacrament is a natural complement to the Sacrament of Reconciliation because they are both means which God usesto heal us. In Confession, we give over to God our sin and brokenness; we are restored to new life.When we receive Jesus in Holy Communion, we are nourished and the supernatural life in us is sustained. Holy Communion is a remedy for sin and a means of deep healing. It is a great privilege toreceive Jesus in Holy Communion but He remains present in Adoration to further nourish, heal, andprovide for our needs. How has this Lenten season drawn us closer to God’s heart? We are only one week awayfrom the most sacred period ofthe Liturgical Year – HOLYWEEK. Perhaps it is time to reflect upon how we have deepened our relationship withJesus during these previous four weeks of Lent. How has this Lenten season drawn us closer toGod’s heart? God is always inviting us to make the choice over and over again to growin our desire to live in His Love, reflect that Love to others,and most importantly to allow His Love to transform ourhearts and actions.